A large Orca Whale (Killer Whale) swims peaceful along the British Columbia coastline. British Columbia on the west coast of British Columbia is one of the very best places to watch wild Orca whales (Orcinus orca, Killer whales) in the Pacific. Especially Vancouver Island offers whale watching tours for tourists to bring them those amazing animals a little closer. 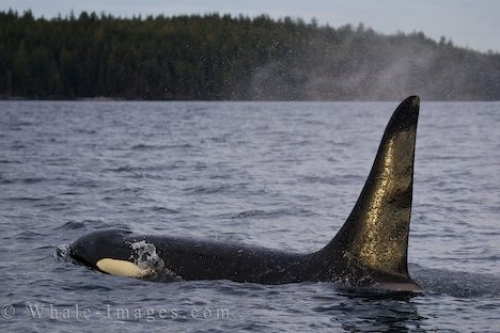 Photo of a single Orca whale male traveling along the British Columbia coastline in Western Canada.